Shooting through foreground objects is one of our favorite techniques for hiding in plain sight. 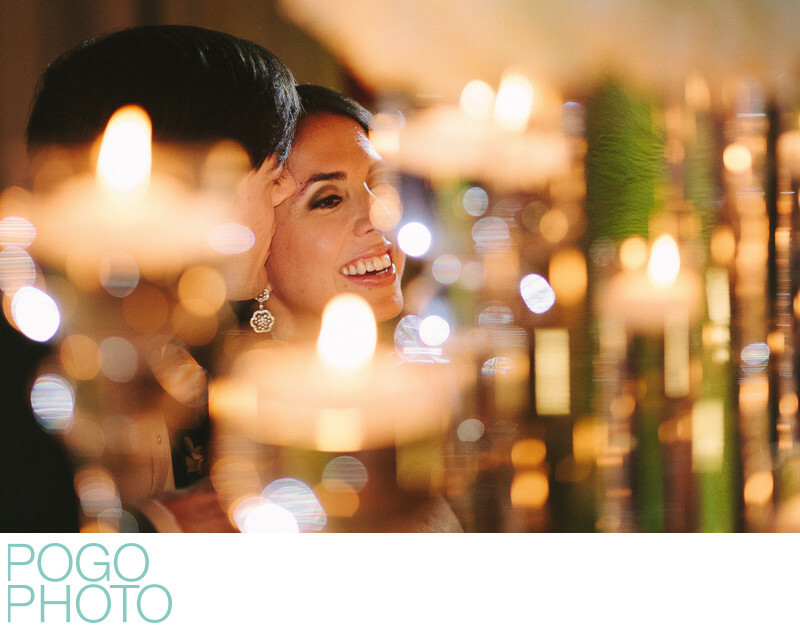 Bonus points if the objects are candles in crystal, which creates dozens of sparkling points of light, such as you see here at the head table of this Coral Gables wedding at The Biltmore. The classic elegance of the varied height centerpieces was a lovely touch to this enormous ballroom, but the way the staggering allowed us to frame the bride's face just as her groom planted a kiss on her cheek was perfect. The on camera flash popped just enough fill light in to light the wrapped stems for a splash of green, add a bit of sparkle to the bride's eyes and earring, and keep her face from being shadowed. The off camera flash about 20 feet to the bride's left filled in a tiny highlight, edging his and her hair and creating additional catch lights in the crystal arrangements on the table. Moments like this are fleeting and this image is indicative of our ability and willingness to wait and watch for the precise instant to click the shutter. This particular moment happened during the speeches, which were emotional, genuine, and lovely, speaking to the many admirable qualities of the bride, the groom, and the two of them as a couple. Location: The Biltmore, Coral Gables, Florida. 1/200; f/2.0; ISO 1600; 135.0 mm.